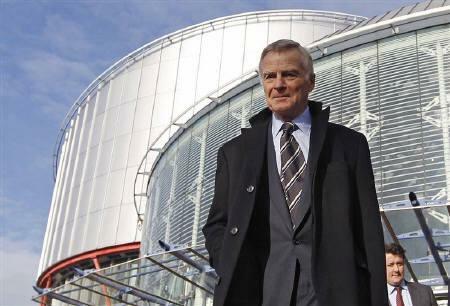 The Court of Human Rights has rejected Max Mosley’s request to refer his case against the United Kingdom to the Grand Chamber. On 10 May 2011, Mr Mosley was unsuccessful in his long running campaign to compel the English press to give advance notice of threatened invasions of privacy. The Court concluded that, having regard to the chilling effect of a pre-notification requirement in privacy cases and the margin of appreciation, there was no violation of Article 8 and dismissed his application (see our Case Comment). On 2 June 2011, Mr Mosley’s solicitors, Collyer Bristow, announced that a request had been made under Rule 73 for a reference to the Grand Chamber. The request was supported by a 13 page Written Submission. We discussed this request in a post at the time. “I write to inform you that the panel of five judges of the Grand Chamber, composed of Judges Jean-Paul Costa, Franҫoise Tulkens, Nina Vajić, Ineta Ziemele and Angelika Nussberger, decided on 15 September 2011 not to accept the applicant’s request that the above-mentioned case be referred to the Grand Chamber. Although free speech campaigners have welcomed the Grand Chamber’s decision (see for example, Index on Censorship), there continues to be a pressing need to address the protection of privacy from unwarranted intrusion. This is a matter which the Leveson Inquiry seems likely to address.